Microsoft announced a couple of months ago that Forza Motorsport 6: Apex would be the first Forza game to be released on Windows 10 PC this Spring. Today, developer Turn 10 confirmed that the Open Beta will be available on May 5, while updates will be delivered throughout the Summer. This will also be the foundation for future Forza titles for Windows 10, since all Forza games in the future will be developed for both Xbox One and PC. Turn 10 also shared the official system requirements, which seem to hint better optimization than recently published Microsoft games like Quantum Break and Gears of War: Ultimate Edition: a single GTX 980Ti or Radeon Fury X should be enough to run the game at 4K@60FPS. We’ve embedded the whole post by Community Manager Brian Ekberg below. A new era for the Forza Motorsport series begins on May 5 with the release of the open beta for Forza Motorsport 6: Apex. Crafted specifically for Windows 10, Apex represents the critical first step in the future of the Forza franchise as it expands into Windows 10 PCs. Apex combines the power and performance of DirectX 12 with Turn 10’s racing expertise, our proprietary ForzaTech™ engine, and Forza’s legacy of stellar content. Most importantly, Forza Motorsport 6: Apex is our way to introduce Forza’s award-winning gameplay to a new audience on Windows 10 and invite a new group of gamers to develop a passion for cars and racing. Forza Motorsport 6: Apex delivers a focused and curated single-player tour of Forza Motorsport’s best content, including authentic wheel-to-wheel action, unique automotive experiences, and constant rewards, all running on DirectX 12 at resolutions up to 4K. In the game, players will be able to dive into a new career mode anchored by a 12-event “Showcase Tour”, where players will race thrilling cars on circuits from across the globe. In addition, Apex’s new “Spotlight Series” events will challenge players with unique automotive events that will be updated on a regular basis. Along with a new set of Xbox Live achievements to earn worth 1000 gamerscore points, Apex players will find new mechanics to explore, including an all-new Race Points system that dares you to turn off the assists, develop your skills, and take on greater challenges. In Apex, players will race a diverse line-up of 63 beautifully detailed Forzavista™ cars, each with working headlights, doors, and cockpits, intricately modeled interiors and exteriors, and full damage. Players can push those cars to their limits on 20 exciting track configurations across six locations, including night and wet-weather variants. 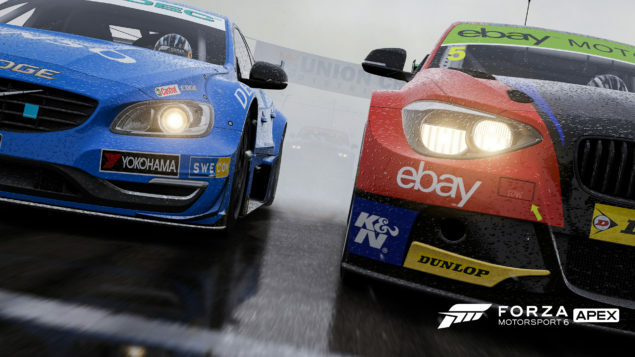 During the open beta for Forza Motorsport 6: Apex, players can expect to play a beautiful, high quality experience that will run on a variety of Windows 10-enabled machines. As a first-party Microsoft studio, Turn 10 is obsessed with performance in Forza games and, during the open beta for Apex, we will be working to improve the game’s performance across a diverse selection of hardware setups (see below for our recommended PC specs). As development continues, players can expect to see updates and improvements to the game. For example, wheel support is coming to Forza Motorsport 6: Apex and Turn 10 is busy working to ensure that Apex delivers the kind of wheel support, performance, and features that racing fans expect from a range of available hardware. In addition we plan to support additional features that we know are important to PC gamers, such as the ability to disable Vsync and an in-app framerate counter. Forza Motorsport 6: Apex utilizes the cloud-based Drivatars of your Xbox Live Friends and the Xbox One community, as well as asynchronous leaderboards for comparing your Race Points, but the game will not feature online multiplayer or the livery design editor. However, in an early beta update, we will be adding a selection of curated livery designs from the Forza painting community to the car select flow. While we can’t wait for fans to play the game, we’re equally as excited about how Forza Motorsport 6: Apex helps us improve the gaming experience on Windows 10 for both gamers and developers alike. Following the beta release on May 5, we invite players to download the game and get involved. Feel free to ask questions and report issues at our Web site, in our dedicated Apex forums, and on our social media channels like Twitter and Facebook. Your feedback is crucial in shaping both the future of Apex as well as the Forza series on Xbox One and PC.